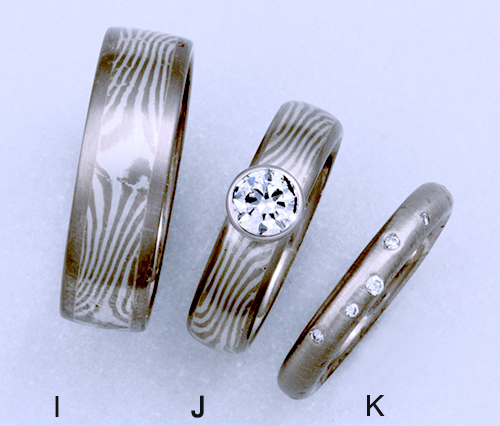 Mokume anrings by John Podlipec and Kim Maitland. Left: John Podlipec: Approx. 6mm flat band, 18K palladium white gold/sterling silver mokume with 14K palladium white gold border & liner. $2100. Middle: John Podlipec: Approx. 5mm 1/2 round band, 18K palladium white gold/sterling silver mokume with 14K palladium white gold liner (no border), 1/4 ct. diamond (SI-1 G-H color). Other stones available. $2500. Right: Kim Maitland: platinum with flush set diamonds.